"We are dedicated to cruelty-free living through a vegan lifestyle. Let no animal suffer or die that we may live!" 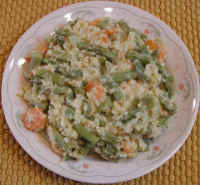 Asparagus, carrots, onions, and rice with un-cheese sauce is a delightful vegan recipe with a cheesy taste that will serve 6 adults as a main meal. Preparation time is about 20 minutes and cooling time is about 40-45 minutes. Leftovers can be stored in the covered baking dish or in other covered containers in the refrigerator for a few days without the loss of flavor. 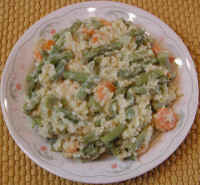 We usually cook the asparagus, carrots, and onions for this recipe in a large covered dish in the microwave oven, but they can also be cooked in a wok or pressure cooker. The rice is cooked in a pot on the stovetop. Begin by placing the water in the rice pot on the stovetop, and bring the water to a boil. Add the rice, reduce the heat to simmer, cover, and cook until all the water is absorbed into the rice. While the rice water is heating, wash and clean the asparagus, cut into pieces about 1 inch long, and place in the large covered baking dish. Wash and peel the carrots and onions. Thinly slice the carrots and dice the onions. Add to the asparagus. Cook until the asparagus, carrots and onions are tender. While the veggies are cooking, put the beans, lemon juice, a little hot sauce, and nutritional yeast in the container of a high speed blender. Cover the container and run the blender at high speed until the contents are creamy smooth. When the veggies and rice are cooked, add the rice to the baking dish and mix together. Thoroughly mix in the un-cheese sauce from the blender container, and cook for another 5 minutes to re-warm and blend the flavors. Serve with a large tossed salad and enjoy! The above recipe is in keeping with God's creation intent (Genesis 1:29-31): 'Then God said, "I give you every seed-bearing plant on the face of the whole earth and every tree that has fruit with seed in it. They will be yours for food. And to all the beasts of the earth and all the birds of the air and all the creatures that move on the ground-- everything that has the breath of life in it-- I give every green plant for food." And it was so. God saw all that he had made, and it was very good.' (NIV) Let no animal suffer or die that we may live! Copyright © 1998-2018 The Mary T. and Frank L. Hoffman Family Foundation. All rights reserved. May be copied only for personal use or by not-for-profit organizations to promote compassionate and responsible living. All copied and reprinted material must contain proper credits and web site link www.all-creatures.org. Fair Use Notice: This document, and others on our web site, may contain copyrighted material whose use has not been specifically authorized by the copyright owners. We believe that this not-for-profit, educational use on the Web constitutes a fair use of the copyrighted material (as provided for in section 107 of the US Copyright Law). If you wish to use this copyrighted material for purposes of your own that go beyond fair use, you must obtain permission from the copyright owner. Thank you for visiting all-creatures.org.